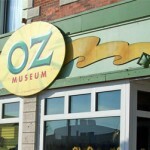 If ever in Kansas, you must stop in at Wamego’s Oz Museum. Kansas has very few tourism draws. Their biggest draws are probably Dodge City, agriculture and the “thank you for visiting Kansas” sign you see as you head east into Kansas City Missouri. So, you can’t blame them for taking great pride in their movie fame. Put 'em up! Put 'em up!!! After seeing other central Kansas sites, we were a bit behind schedule and didn’t get to the OZ Museum until around 4:15 p.m. (of course it closes at 5:00). While we were a little disappointed, we definitely had to see it, even if it was only for 45 minutes. This amazing museum recreates memorable scenes from the movie with impressive wax-cast figures and bright colors between features of memorabilia and promotional items from both the hit movie and the well-read children’s book. We had fun looking at each item as Kimmer and I have always enjoyed this movie, even though it was released over 36 years before we were born. The museum has scenes featuring all the main characters of the movie – Dorothy, the Scare Crow, Tin Man and the Cowardly Lion, as well as supporting characters like the Wicked Witch of the West and Glenda – the Good Witch. Each scene is followed by a detailed history of the actor who portrayed them on film. As we walked through the museum, we discussed our favorite characters and scenes. Kimmer is partial to the Cowardly Lion while I, as most little girls, always cherished Dorothy and Glenda. The museum even has the movie on a constant loop in a theater – if only we had the time, we’d probably have watched it straight through twice. In the gift shop, there were absolutely adorable stuffed Totos that were just so soft I could have snuggled them all day, and across the street is Wamego’s “yellow brick road” you can follow after discovering the wizard at the Oz Museum. For more information, click here.